Commisariat Gateway [Sherpur Cantonment, Kabul]. bl.uk > Online Gallery Home	> Online exhibitions	> Asia, Pacific and Africa Collections	> Commisariat Gateway [Sherpur Cantonment, Kabul]. Photograph with a view within the Sherpur Cantonment situated a mile north of the city of Kabul in Afghanistan, looking towards the gateway in the centre of the southern wall. It was taken in the winter of 1879-80 by John Burke. 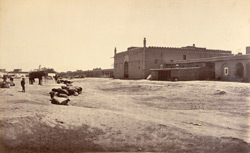 It is part of a series of pictures of Afghanistan taken by Burke during the Second Afghan War (1878-80), which form an important visual document of the country as it was during the time of the Great Game or Anglo-Russian rivalry in the region. In 1878 Burke accompanied the British forces into Afghanistan, despite being rejected for the role of official photographer. He financed his trip by advance sales of his photographs 'illustrating the advance from Attock to Jellalabad'.